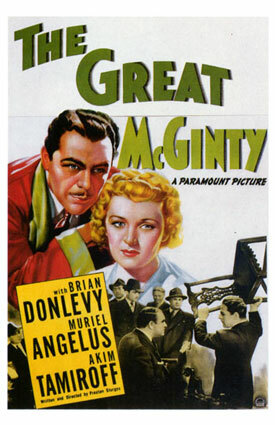 Penned and directed by Preston Sturges, The Great McGinty tells the story of a man who, after impressing a mob boss with his audacity and charm, is set up as a puppet mayor. All goes well until he falls in love with his politically-arranged wife, who encourages him to be a better man. The story is framed by scenes in which McGinty, now a bartender, tells his story to a drunk patron and a dancer. Whether or not this enhances or takes away from the story is open to interpretation. Personally, I was a fan of the technique but not the execution. When done well, it can enhance the poignancy of a story. Unfortunately, all it seemed to do here was give away the ending. Overall, I was left unsatisfied because McGinty’s arc didn’t stick. We see him start as a bum, move to a bum in a suit, and finally (via the love and encouragement of his wife) become a man who deserves to wear that suit. Right as he’s finally become the man he should be, he’s carted off to prison for prior nefarious deeds. He escapes with the mob boss, moves to a foreign country, and does more or less nothing with his life despite this transformation he supposedly had. The last scene was humorous, but it was also hollow. And now for the good. The movie had a surprisingly modern feel to it. Most classic films I’ve seen feel classic. They meander, and the dialog feels sluggish somehow. This didn’t seem to be the case with McGinty. I can’t quite put my finger on what exactly the difference is. Without actually taking out a stopwatch and doing some comparison, I’d venture that the typical dialog length in McGinty was shorter than the average film in the ’30s and ’40s. There was more back-and-forth than soliloquy, and I think that must have added to the modern feel. There was also a particularly defined shift in the tone of McGinty’s dialog from the beginning to the middle and to the end. In the beginning, McGinty as the bum speaks with a lot of slang and a slight drawl. He strikes a happy medium between educated and down on his luck. As the puppet mayor, his drawl increases and his speech becomes less concerned with appearing educated, which, of course, is kind of the opposite of what you’d expect for a man going from bum to mayor. At first it bothered me. But when I gave it some thought, what it really represented is McGinty shutting off a part of himself that cared what other people thought of him. To do what he was doing (which was making money for the wrong people and ignoring the plight of his constituents), he had to shut off a part of himself that cared about anything. His lack of careful speech represents this. Once he falls in love with Catherine, the woman he married for purely political reasons, he starts to care again. Before he’s carted off to prison, he’s carrying himself like a governor should. He speaks carefully, with obvious thought behind what he’s saying. When we see him as bartender, he’s reverted back to his original happy medium. The shift was clever, though whether via the writing or the delivery, at times it was overdone. Nonetheless, it gives me food for thought when watching my own characters go through an arc. Overall, I wasn’t blown away, but it was a solid film. There aren’t many films of that era where I think a remake would improve the material, but I think this story is ripe for an update.